(It's more a 3.5)A nice little cosy mystery.I am very glad that an internet friend of mine sent it to me after she had read it. I am a lover of everything Sherlock Holmes related and the plot seemed really original.The whole universe created by Sophie Weeks is really interesting and well presented. From the first page you have enough elements to start wondering and appreciating the fluid and well-balanced writing as well as the unique setting. The slight touches of French culture interested me of course, and were on the whole coherent.The whole meta-fictionnal comment on characters from books and poems having a life of their own opens nearly an infinite world of possibilities and I liked the casual tone used by the authoress: the bureaucracy authorizing holidays in other genres of books, etc. However, as it is such a short book, we do not have an immense amount of extra information and descriptions and I missed it. This kind of setting requires explanations I think and that's a little bit disapointing not to have them.The plot on the whole was interesting and I liked wondering on whom could be the culprit, but as the resolution is so quick I felt a little cheated. You do not have the time to really understand the motives of the person and then you have the ending pretty quickly. (view spoiler)[ I was not totally against the romance between Isabella and Sherlock Holmes. I understood that it was not really the character from the Conan Doyle's stories that we had here, but as I have said before, the book is short, and so we do not have the time, I feel, to fully embrace their story before its conclusion. Moreover some love declarations were too mushy for me. Particularly in such short a novel, where the characters have only known each other for a hundred pages or so. And of course considering the temperament of Holmes. Isabella cried a little bit too much for my taste as well. (hide spoiler)]I especially brought this book with me on holiday and I found that it was a perfect read for Christmas time. I really hope that Sophie Weeks will write another story set in the same world and will give us more explanations on everything. A very different little book which I did enjoy despite being unable to entirely classify it. The concept of characters having a different life when outside the spotlight makes sense to me, as does the whole experiment with 1st person narration. I am a little puzzled still to think that certain character types get recycled -- not saying there aren't stock types in many books and that some of them don't seem to be the same person even when written by different authors, just that the book indicates that there a lot of unused characters just like out-of-work actors and since Isabella pretty much stays put where she is, why wouldn't these characters? Slight disconnect for me there.One thing I did like was the concept of Isabella getting to know herself better by leaving her normal world and by seeing herself through the eyes of others. The courage to take the first step and go on holiday ultimately sets in motion a much different future for her, but it doesn't flow smoothly and she nearly sabotages herself by going back to her comfortable habits. That rings true for me and I think provides some good psychological insight for many people. I loved the premise of this short novel by Sophie Weeks. I've always wondered what some popular literary characters did when they weren't busy being in the book. How would they react and respond in different situations and with completely different characters? Ms. Weeks does a great job playing this out in her book. It's a quick read and quite entertaining. I thoroughly enjoyed it. 4.5This was very charming and VERY clever. Review to come. Jasper Fforde meets Jane Austen at 221B Baker Street,I love the premise of this story which reminds me of Book World in Jasper Fforde’s Thursday Next novels. Though not as funny as Fforde’s series, Outside the Spotlight shares the idea that literary figures interact in a genre spanning universe and have their own lives, joys, and unique problems. The “not as funny” comment isn’t a criticism. 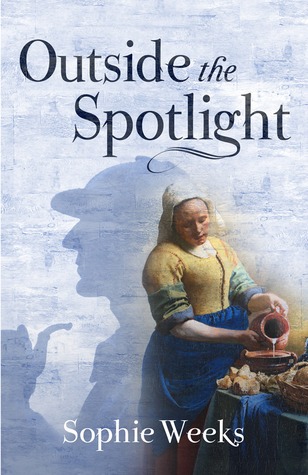 There’s still plenty of humor--Fforde would be hard to beat for funny--and with mystery and romance Outside the Spotlight has its own charms.Isabella has spent the last 400 years as a sixteenth century milkmaid from a Christmas carol. She has 200 recipes for Christmas pudding, she’s witnessed the birth of the Christ child, and she’s friends with Santa Claus (who drinks too much when he’s off duty), but Isabella is tired of winter weather and longs for the chance to go someplace warm. She applies to take a vacation as a character in a mystery novel, and for that she is trained by none other than Sherlock Holmes. In spite of their disparate backgrounds, there’s mutual respect and a burgeoning attraction between Holmes and Isabella, but--like many characters in Jane Austen novels--neither is the type to blurt out their feelings. Their relationship might have ended with the training except that when the unthinkable happens in the mystery Isabella has a role in she turns to Holmes for help. As someone who enjoys books about books, I love the cleverness of the cross genre relationships and complications. With convincing characterizations and an entertaining plot, Outside the Spotlight is a fun and satisfying reading pleasure. Isabella, who stars in a French Christmas carol, lives in a land of all things Christmas: every song, story, poem, and legend about this holiday coexists in one place. However, after several centuries she's grown tired of her monotonous existence and decides to vacation in the land of Mystery, where she meets the famous Sherlock Holmes. There are some strange philosophical issues raised here, but suffice it to say that these characters know they are characters but they remain fairly autonomous nonetheless. Many writers talking about how their characters often will do things they don't expect, and this sort of takes that to the next level. Sherlock's presence is slightly gratuitous, but it remains a very fun story, especially delightful to anyone who's ever dabbled in writing fiction. This is a delightful book!Outside the Spotlight is an engaging read. The language is clear, strong, and beautiful. There are so many phrases and creative thoughts I'll remember for a long time. It takes place in the World of Genre. The protagonist lives in Christmas. I just love that! Literary characters were merged and knit together in a way that worked.Sherlock Holmes was perfect, he never once gave me a second thought that he WASN'T Holmes...which is an amazing feat. The main character, Isabella, is gentle and smart, two attributes which aren't combined often enough. Her wonderful internal dialogue attached me to her right away.I liked the book a lot, and would've given it 5-stars if only there was more tension. In Weeks’ mixed genre novel, Isabella has lived in Christmas for four-hundred years. Now she wants a vacation from it all and soon discovers the world outside is far more dangerous than she had ever imagined. When Isabella is granted permission to visit Mystery, she is witness to a shocking crime and must assist Sherlock Holmes and find the murderer before more literary characters are threatened.A very entertaining read that mixes mystery and romance freely. 3.5. I wanted to like this so much more. Misty at the book rat recommended it, and I usually love her recs. This was, however, a solid 3 for me until the end which bumped it up to 3.5. For 3 bucks or whatever it's absolutely worth it. Especially for the world which is delightful. This story turned out to be really good and kept drawing me back to read it more and more!